. : Farm Forest Line - The location, area and type of forest:. The location of a forest can be marked on a farm plan or topographic map. Making a note of the map coordinates, or even the longitude and latitude, may be a requirement for joint ventures etc. The centre of the forest, a prominent corner or other referencing point may be used. Where the forest includes areas of different species, age classes, soil types or performance, the areas may be separated into homogenous units so as to facilitate ease of forest measurement. This stratification makes the results more useful and accurate, and may even reduce the costs of any sampling procedure. It is often crucial to obtain an accurate assessment of each forest block area. This is because most assessments of timber volume involve the measurement of a sample of trees rather than the whole stand. The results from the sample are multiplied out on the basis of the calculated net or stocked area of each block. Errors in area assessment can result in large errors in timber volumes. To calculate the area, an accurate map of the forest boundary is required. 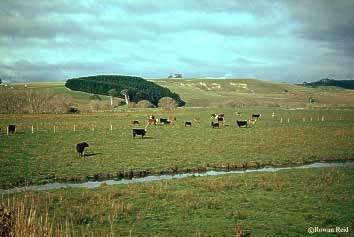 The boundary might be defined by the location of tree trunks, the extent of the tree canopies or by the paddock boundaries. Maps can be based on field measurements of the length and bearings of every side of the plantation but this is often very time consuming. It may be easier to identify each block on a topographic map. This can be done using GPS data collected at each corner. If aerial photographs are available that show the boundaries of the forest, these can save time, although it may be necessary to make corrections for slope or photographic distortions. Once calibrated for scale, many computer programs can generate areas of irregular shapes very quickly. Dot matrices or fine grids copied onto clear plastic sheets are useful for manually estimating the area of irregular shapes on farm plans, aerial photographs or topographic maps. For narrow belts it may be more practical to simply measure the length of belt rather than try and determine the effective area of the planting. Results may then be presented in terms of yield per 100m of belt rather than yield per hectare.